Audi is now the most desirable new age luxury car brand in India. Audis have a kind of aura around them which is rarely seen anywhere else. As this in mind, Audi unleashed its little big monster on the Indian markets recently. Q5, as the demon is named, is aimed at the compact luxury SUV segment in India which is already seeing some major competition. At a glance, the Q5 might seem like a mini Q7 but being in there makes all the difference. let us know about this beast. There are three variants on offer in the Q5 (Premium, Premium Plus and Navi) which was priced for the Base petrol at the start of 43.17 lakh and the 3.0litre diesel is priced at a hefty Rs 48.71 lakh. (ex-showroom, Delhi). Audi has made some minor rectifications in the engine of the facelifted Q5, the Q5 is now 15 percent more fuel efficient than its predecessor. There are 3 engine options for the Audi Q5, The 1984cc 4-cycles in-line direct injection turbo-petrol engine generates maximum power of 221bhp at 4500-6200rpm and 35.6kgm of torque at 1750-4500rpm, the other 1968cc 4-Cyl inline turbo diesel engine generates 174bhp of maximum power at 1750-2500rpm and 38.7kgm at 1500-2500rpm. The bigger 2967cc V6 turbo diesel engine generates 245bhp of maximum power at 4000-4500rpm and maximum torque of 59 kgs at 1400-3250rpm. The new bigger engine of the Q5 which is the turbo diesel V6 engine now generates 5 bhp of more power and 8 Kgm of more torque than the older Q5, Thus this engine is a beast and when you will press the paddle there is a burst of acceleration from the turbo charged diesel engine. The 2.0 TFSI turbo petrol is a much smaller engine and delivers lesser power and torque than the bigger engine still the available power is plenty but the engine is much smoother and responsive. The Petrol engine has been mated with an 8-speed automatic gearbox which is a bit slow but useful because it needs less effort from the person driving the vehicle. As of ride quality, It was said to be a best handling premium SUV’s in the Indian market. This Audi has been employed with the famous Quattro set-up which splits the power delivery by 40/60 under the normal driving circumstances which result in better handling, acceleration, and at the time the 235/65 rubbers also provide the enormous amount of grip on the road. The Q5 has been fitted with Independent, Macpherson strut at the front and Independent multilink suspension setup at the rear which offers a better suspension on uneven roads. The Q5 is a strikingly good design. The car is really compact (its actual dimensions being 4629mm in length and 1880mm in width)for its segment. This helps it to easily manoeuvre through Indian traffic stricken roads and parking is also easy. But the Q5 gives an illusion of being bigger and looks similar to its big brother Q7. The front is adorned by the Audi-characteristic gaping grill and the daytime running LED lights adjacent to the headlights. LED tail lights are available as options on the well designed rear ends. Some of the interesting exterior features are Alloy wheels 7 spoke design, Exterior mirror electrically adjustable, dimming folding and heated, High Gloss package, Rear spoiler, Xenon plus headlamps, LED rear lights. Excluding the basic existing features it also interesting interiors features like Leather Milano upholstery, Front seats electrically adjustable, Manual blinds for rear windows, Inlays in walnut brown, Sun visor driver passenger side, Lighting package, Panoramic glass roof, 4 way lumbar support, front centre armrest, 3 zone automatic air conditioning, Parking aid plus, Audi music interface, Audi sound system, Driver information display with color interface and Bluetooth interface. 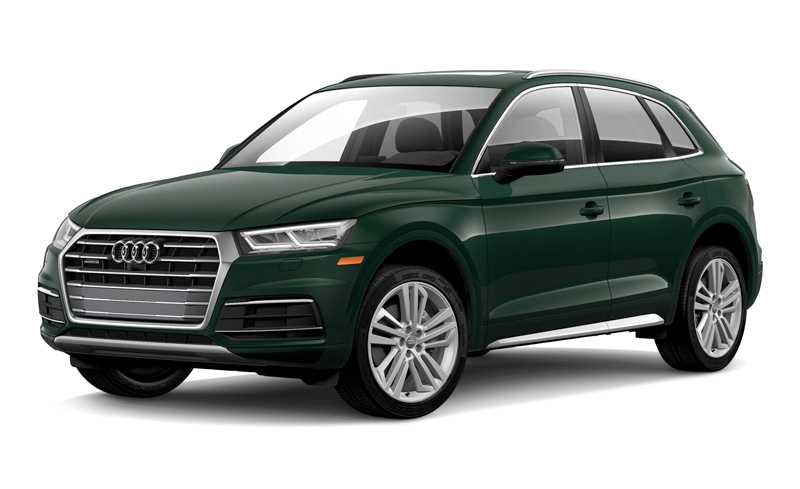 The Audi Q5 is definitely a huge deal which comes with lots of added features, the exterior styling of the Q5 looks much sportier and attractive than its predecessor. Overall The Q5 tempts the customers with its pricing and grabbing look.